Creep Blue Sea is the second level in Quiver Cliffs in the game Wario Land: Shake It! It is also the last Subwarine level in the game. The level takes place in a beautiful dim ocean filled with many blue rock formations and beautiful rainbow-colored coral. There is also a mini-boss at the central part of the level, which Wario needs to destroy to proceed. 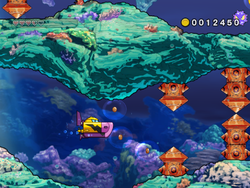 Many spikebombs and spiky pillars also act as obstacles during Wario's quest underwater. Like the other two levels, Wario need to destroy the blockade before freeing the caged Merfle. This page was last edited on March 4, 2019, at 17:30.